If you are searching for that one great banana cake recipe, the one that will always impress people, taste great, is easy to throw together yet so hard to mess up, then this is the cake for you. 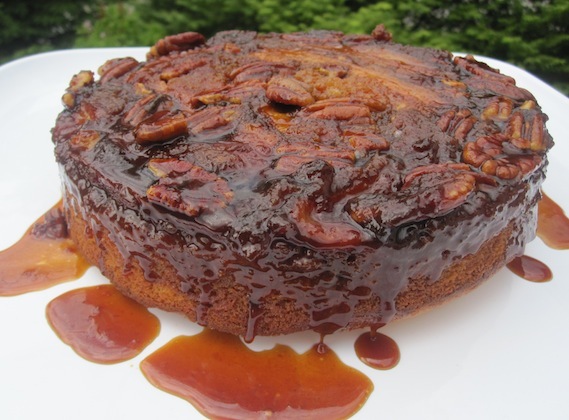 A couple of weeks ago I was feeling guilty about the ripe bananas sitting on my counter that were about to go bad, so I made this Banana-Pecan and Dulce de Leche Upside Down Cake… and it was soooo delicious. Upside Down Cake is best served warm and even better with vanilla ice cream. I can’t wait to make it again. Buen provecho! Place a rack in the middle of the oven and preheat to 350 degrees F. Lightly butter a round cake pan. To make the topping: Heat a small saucepan over medium-high heat. Add the butter and sugar, cook stirring occasionally, until it’s browned, about 5 minutes. 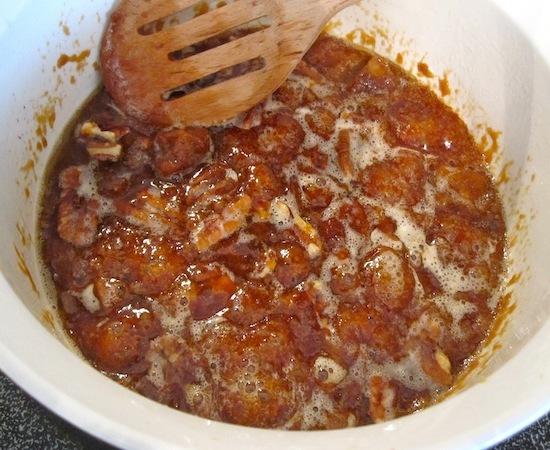 Remove from the heat and add the pecans. Pour the butter-sugar mixture into the cake pan. Using a rubber spatula, spread the mixture out so it to covers the bottom of the pan. Arrange banana slices evenly. Press the slices into the butter-sugar mixture. To make the cake: Using a sieve over a large bowl, sift together the flour, baking powder and salt. Set aside. Add the eggs one at time, waiting for each one to be fully incorporated before adding the next. Reduce the speed of the mixer to low. Add the flour mixture, milk, dulce de leche and banana. Raise the speed to medium and mix briefly until a smooth batter is formed. Pour the batter over the banana layer, distributing evenly. Bake the cake, rotating the pan once during cooking, until golden brown and a toothpick inserted in the center of the cakes comes out clean, about 45 minutes to 1 hour. Remove the cake from the oven and let cool for 5 minutes. Run a knife around the edge of the pan to release the cake. Carefully invert the cake onto a serving plate. Oooooooooooooooooooooooooooooooo I want half of this! Wow does that look delicious Erica!!! I want to bite my monitor…LOL!!!! A very rich and yummy cake! I don’t usually comment on dessert posts (because I don’t bake + avoid sweets and therefore can’t relate). However, I have to make an exception here. This looks delicious! And I want some. I don’t like the flavor of banana bread but this, well this could just put me over the edge. A very rich and delicious cake! Oh My God!!! Erica, I subscribe to your feed, so this morning I saw in my email the title of your cake, and the whole time in the shower all I could think about was upside down dulce de leche banana cake. It’s a combination of my most favorite things. And now that I’ve seen it. I’m almost drooling. It looks sooo good. Oh, my, goodness!! 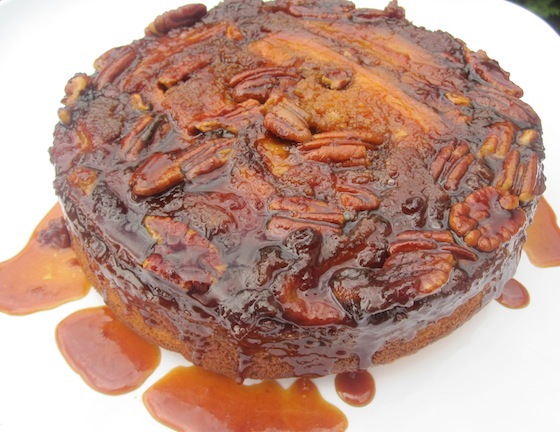 That cake is divine … I love dulce de lche as is but in this cake with pecans. That gooey goodness is making me salivate! Ooooooooooooooooooooh you did it again! Great recipe! As someone living in Argentina, I think I’m qualified to opine on desserts featuring dulce de leche. This cake looks out of this world!!! I will definitely be giving it a try. Thanks for posting your creation. Wow, a stunning dessert! I just love the flavor combination of bananas, pecans and dulce de leche! Yum!!! 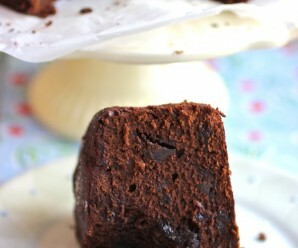 Looks very moist, gooey and just perfect. Have never made a cake with dulche leche yet. Ooh what a brilliant idea! I love banana bread. I always feel guilty throwing away ripe bananas so I will keep this recipe in mind next time. 🙂 Thanks for your kind words on my blog. I always love reading your new posts. Oh especially that shrimp and orzo recipe… I can’t wait to try it again! Wow this really looks delicious. I love banana cakes but have not seen a better one. This looks really delicious with all those caramel pecan banana topping…mmm. Thanks for sharing. i may never make banana bread with my brown bananas again–this looks like one winner of a recipe! that oozing and luscious dulce de leche is the kicker–amazing creation, erica! God this cake is THE ultimate. I am floored. And drooling. Amazing. Wow, looks so moist and delicious!!! Holy cow! Erica, this just looks sinful and delicious. This brings banana cake to a whole new level. I love banana bread and I love pecans and the two paired sounds like a trip to nirvana! Oh my Erica, I can relate with Joan here but the cake looks wonderful!! Thank you all for taking the time to leave a comment! I truly appreciate it! This looks sooooo good Erica! 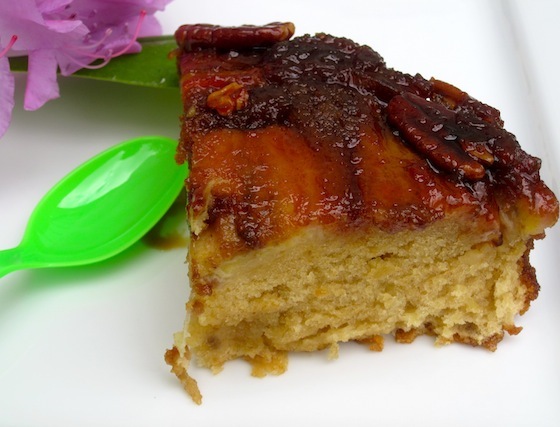 I love the brown sugar topping and how it melts over the cake — beautiful! Oh my gosh, This looks absolutely incredible, and guaranteed to get me in trouble! I’m not sure I should I think you. I meant to say “Thank You” which of course I do, but its the extra running I’m thinking about. I have a Colombian birthday party next weekend and I find this cake to be innovative and I would like to bake it for this party. I do have a question. How many servings per recipe does this cake have? I would like to do the calculations to supply for 20 guest. could you please respond whenever possible as I would like practice throughout the week prior to the party. Isabel- About 10 to 12 servings. I made this for a graduation party for a Colombian friend last night. Needless to say, it was a huge hit. Despite being cooked and reheated for the ice cream, it stood up to all abuse so it is not too delicate for a long day. Thank you. Am at a loss, what is Dulce de Leche or arequipe? All strange to me here. Hi! You forgot the Vanilla Extract!! When was I supposed to incorporate? I just realized when I put it in the oven!! Sorry! I am going to check the directions! Well, it’s been two years and I can’t believe that this recipe has not been resurrected since then! I am about to do so! Can’t wait to try this. Have been searching on the internet forever for the right dulce de leche recipe and this is it. 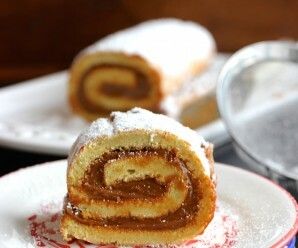 Not too tricky and I wanted to find something where you actually add the dulce de leche right into the recipe as well. I have 1 1/2 cans I need to use up in the fridge! This is my “one week before my birthday week” in cold Canada and this is how I plan to celebrate and warm up.